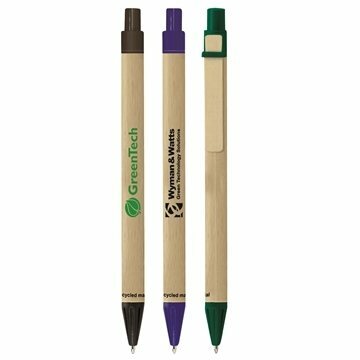 Nature calls with this pen made of recycled paper. A great look for the environmentally conscious! Body made with 100% post-consumer recycled paper. Embroidery could have been better. Everything else was great. Just the right playful twist to promote summer and our product- thanks AnyPromo! Happy using the product. these went over really well with the membership! I like having the choice of colors so that there is a variety from which to choose. The imprint is what we expected and it looks great. I liked everything about the product, especially the price, which was the best I found.